I believe that many years ago I read the words: “Trees are Rooted Men.” On the other hand, I may have simply imagined that quote. Regardless however, I often see the human form within the structure of a tree, and in many of my supposedly simple landscape paintings, there is an element of the human reflected through a tree or two that I have spotted on one trip or another into nature. Let me try to explain that by telling you about 4 of my paintings with trees. “When I was a child, I was surrounded for miles by cotton fields, cotton gins, and the dark, rich soil that the Mississippi River had deposited there in earlier years. Because the Bootheel of Southeast Missouri is the flood zone of the Mississippi River, the soil is so very rich that hardly any of it is wasted on trees. Occasionally, you might see a narrow line of vegetation, crossing the terrain, but that would probably be on the banks of one of the small creek-like waterways that were long ago dug there to catch the river, should it flood again. As I noted in the previous passage, the land in the Bootheel is extremely flat and almost free of any trees at all. When I remember looking out across the endless miles of farmland back home, I am often reminded of Salvador Dali’s painting The Persistence of Memories. 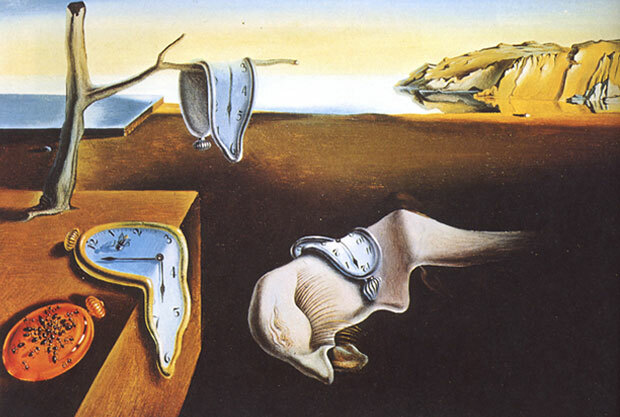 Dali’s painting of an eerie landscape of clocks reminds me of the surrealistic quality of looking out across an almost barren Bootheel field. [When the fields are not planted, the soil is virtually barren]. The essence of this memory for me is almost one of withered isolation, and that is what I tried to capture in the dried twig in my painting One Ditch. The twig in that painting is like a parched human spirit that is alone and barely hanging on in a vast and empty field. Honestly, that describes one side of my personality. It is not what most people see in me but regardless, it is there. On a recent trip to Boxley Valley, which is near Ponca, Arkansas, I spotted the interesting tree in the above photo, and that tree tells an entirely different type of story. Although the barn is old and withered in the above photograph, the scene is not barren. The grass is green, and the tree has green leaves. Light seems to be rising out of the ground. If the above tree were a person, he would seem to be reaching his large arm out and around the barn. The tree is sheltering the above barn, and the sheltering, nurturing nature of the above tree gives me a good and warm feeling, and that is what I tried to capture in my painting Barn at Boxley Valley. I cannot tell you how very much that I agree with what Hesse has to say about trees. About 35 years ago, I had a farm in Mississippi. Part of the land was pasture, and my thoroughbred horses skipped and kicked up their heels on the grasses there, but the part of my land that I loved most was the forested area in the back. Because my woodlands touched a vast forest behind it, my wooded vale seemed to stretch forever, but I found a small clearing in those woods. The clearing was in a dry creek bed, and I placed an old folding chair there and just left it, and I continually returned there for solace. For several years, that spot was where I felt sheltered from the world. It was where I went to have my spirit replenished. That spot was my sanctuary. Most often, when I sat beneath the ancient hickory trees that were planted around that folding-chair-spot, I felt that the trees themselves-the elders–had woven their arms around me, and that I was comforted in their embrace. Old and Gothic, the walls of my sanctuary stood tall. The fingers of the trees were laced together above my head and during the autumn, the sun peered through leafy limbs and the colors of the leaves and blackened branches were like stained glass windows. When I sat beneath my trees, I typically felt that no place was more peaceful than mine, but one autumn day, I sat there and watched a storm gather and whip through the golden leaves above me. Suddenly, all of the wise, old men writhed and raised their arms and shook their fists toward the sky. Afterward, they swayed from side to side. That day, my trees were angry preachers, and then, they became prophets. I have always felt the most spiritual when I am surrounded by ancient trees. “A tree says: A kernel is hidden in me, a spark, a thought, I am life from eternal life. . . . I was made to form and reveal the eternal in my smallest special detail. I myself am growing older now. My 68 years of living are nothing compared to an old, sage tree, but I am nearer to the end now than I am to the beginning. About 20 years ago, one of my children suggested that I sell everything and move into a high-rise condo in the city. I responded that I would rather die than do that, and I meant those words. My daughter thought that I was being melodramatic and feeling sorry for myelf, and I tried to explain by saying hat I absolutely NEED a little piece of land that is my own–I NEED a yard and some trees, and high-rise condos only have metal and concrete–they have no yards and trees. I fear the day when I can no longer manage to be surrounded by nature. It is essential to my soul. My students are about to begin studying trees and landscapes, but before we begin that study, I wanted to share with them that usually when I paint a tree, I paint a character. When I paint bodies of trees, I paint churches. I treasure that person’s words. I am not a terribly precise or accurate painter, but I have something else to offer my audience, and the person who wrote the above words sensed that. I am a very reflective person, and on successful days, my paintings capture my spirit–and not my precision, and in my opinion, that is what art is all about. Note this nougat of truth: I am a fairly good photographer, and if all that I want is visual accuracy, I should stick to photography. The above photograph is a mere snapshot that I quikly captured on my Iphone. I have better cameras than my Iphone, but I rarely have them with me. If need be, I can take EXCELLENT photos, but my art is about more than a photographic representation–it is about more than replicating reality. My art is about my life experiences–about what I feel. And that is why I paint. In many ways, I am an old and broken pot of clay, and I know that I have not lived my life conventionally. While other people were working at regular jobs and creating nest eggs and retirement funds, I was romping through the woodlands and thinking and feeling and listening and writing and seeing and painting; and now that I have reached the autumn of my life, I sort of regret my choices. At the very least, I definitely wish that I had more money to pay someone to care for me when I am ancient–but then again, I would not want to have lived my life differently. Granted, my friends are living in vast homes and are surrounded by luxuries now, and I live in a tiny cabin on top of a hill in the Ozarks. And that speaks volumes. After I moved to the Ozarks, however, I painted Autumn in the Ozarks. People do not realize that the titles of my paintings usually tell their stories. The title “One Ditch” tells a story, and so does the title “Autumn in the Ozarks.” Very simply, I have reached the autumn of my life, and I have come to the Ozarks to live until I die. Once again, read what Herman Hesse has to say about trees and scars and dying. With no need for elaboration, suffice it to say that I will take many of my own personal scars to my grave, and I can only hope that people will somewhere see within my ruins the rings of my life–the marks where the suffering and the sickness and the happiness and the prosperity and the beauty live forever. And if there is any chance for that to be, it will be through the words that I have written and from my art. And very simply: that is why I write and why I paint more than the photograph has the ability to see–much less, more than the ability to say. As you begin to paint your trees, look for the people–for the souls who are living within them, and strive to paint the souls.